It’s that time of the year again. 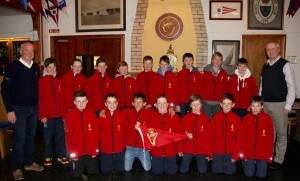 On Thursday this week for four days, 19 of our Optimist Dinghy sailors are competing at Trials, run out of Howth Yacht Club. This is a closed event which the sailors have qualified for by competing in regional and last years national championships. Those who do very well, qualify to represent our country at World, European and French Nationals. They have all worked very hard and have been training with just a small break during the winter to give themselves the best chance of doing well. There will be 57 competitors taking part so the Royal Cork’s contingent will be very sizeable. They will be helped as always by their parents, as well as their professional coaches Thomas Chaix and Diego Blatt both on and off the water. For some this will be their third trials. For seven of our sailors however it will be their first. We are very proud of each and every one of them and would like to wish them all the very best of luck this week. The sailors include ( in no particular order Rory O Sullivan, Jonathan O’Shaughnessy, Patrick Bruen, Michael Crosbie, Adam Power, Robert Keal, Aoife Byrne, Cathal O’Regan, Killian O Regan, Cillian Foster, Justin Lucas, Jack O Sullivan, Conor Horgan, Eoin Horgan, Richard McSweeney, Harry Twomey, Harry Pritchard, James Hassett and Ben O Hare.